This article contains a guide how to unlock Dark Link's outfit. Dark Link appears as the final boss in Legend of Zelda 2. However, in Legend of Zelda: Breath of the Wild, Dark Link’s outfit is an unlockable. In fact, it comes with its own special effects. Some of these special effects include increase of speed during night time. 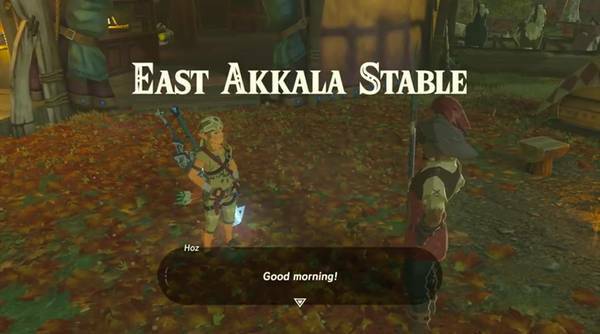 First, speak to Hoz at the East Akkala Stable. He warns you that the place has become increasingly dangerous lately. Hoz warns you about a guy name Kilton, running the shop Fang and Bone. However, this man appears to only appear after night. 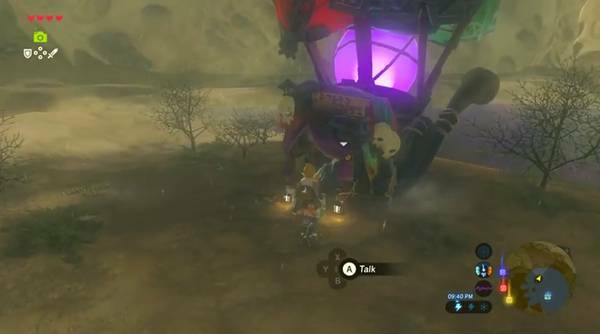 If you want to track down this Kilton guy, make your way to Zuna Kai Shrine. The shrine is near Skull Lake, the most northeast part of the map. While the shrine is on the right eye, leap off the left eye to find a peninsula hidden in the lake. There, you’ll find Kilton. He disappears after 4 AM and only appears starting after 9 PM. But don’t worry, he’s easy to find, he’s using a colorful balloon. Then, he’ll ask you about monsters. 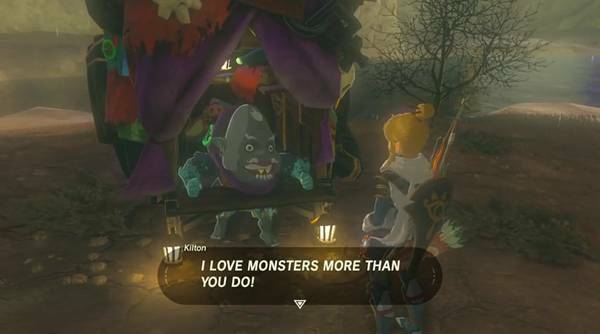 Select “I love them.” and then, “I ADORE THEM!”, prompting a lash out from Kilton. After this, he’ll ask where to appear. He’ll either appear at Kakariko Village, Rito Village, Zora’s Domain, or Hateno Village. But he’ll also mention that he can show up at Gerrudo Town or Lurelin Town or Lake Akkala. However after the text, he’ll disappear. Now that happens, you can meet him in any of those locations. Speak to him and he starts explaining to you about Mon. 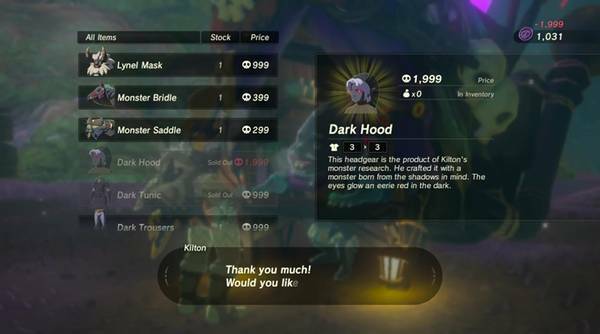 You can sell the monster pieces and you’ll unlock a variety of masks such as the Bokoblin Mask, Lynell mask, and etc. Once you complete those, Kilton suddenly introduces to you something known as the Dark Series. Then, open up the menu to find that he’s selling the Dark Hood, Dark Tunic, and Dark Trousers. Everything should cost at least 4000 mon. With that, you now can go around as Dark Link and relive the old glory days. I was under the impression that each monster mask only unlocks after a certain number of divine beasts have been completed. Since I haven’t beaten Ganon yet, I would guess that this “Dark Series” might actually unlock after beating Ganon. I can verify that the dark set unlocks before gannon. Not sure what the trigger is though. I think it might have something to do with buying or selling a certain amount of Mon, but that’s just guessing on my part.